When the Rose Hill Savings Bank opened for business in 1854 at the corner of 14th Street and 8th Avenue, it was a insignificant institution in a less-than-fashionable neighborhood. The bank occupied the basement of a five-story building, underneath the New York County National Bank on the first floor. “The upper floors being occupied as offices by lawyers, real estate agents, etc.” according to The New York Times. However, as commerce moved uptown and the 14th Street neighborhood improved, so did the circumstances of the Bank. 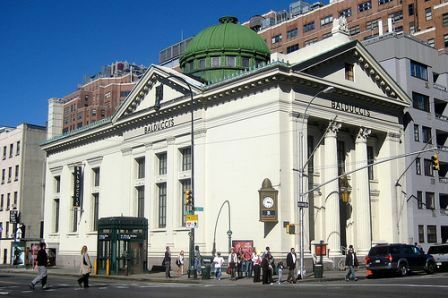 By the first day of the year in 1862 when it changed its name to The New York Savings Bank, it had become a substantial neighborhood presence. When, in 1874, three robbers were caught trying to tunnel into the bank vault from the adjacent cellar under a “pool saloon” next door, the bank had assets of around $3 million. As the turn of the century approached, a more suitable building was deemed necessary. 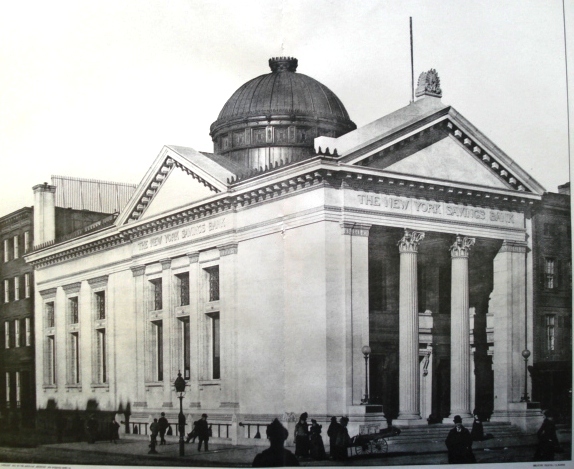 In 1896 the bank commissioned Robert Henderson Robertson, who had established his reputation designing important ecclesiastical and academic structures, to design their new bank building. Following the Financial Panic of 1893 banks felt the need to appear solid – as though they had existed stably for centuries. The Architecture Record emphasized, “The effect of the structure must be one of great importance and simplicity. It must make on the depositors the impression of being a perfectly safe place to leave their money and valuables." In addition, the 1893 World’s Columbian Exposition in Chicago had popularized grandeur in architecture as a means to enforce “order, clarity and sobriety” – hallmarks of the City Beautiful Movement. Robertson’s resultant building was a Roman temple of white Vermont marble. Finished in 1897 the three-story structure was capped by an impressive copper dome surrounded by twenty square stained glass windows. Consistent with the Roman model, the roofline was trimmed by elegant copper artefixae. Two imposing Corinthian columns flanked the entrance. 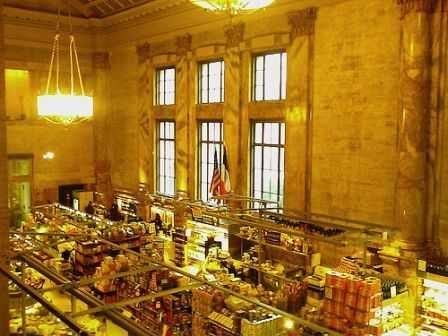 Inside buttery-colored marble walls and pilasters rose to a barrel-vaulted coffered ceiling. A marvelous bronze two-faced clock on the corner of the building supports a beehive – the symbol of thrift -- while industrious honeybees flit around the clock faces. Sometime before World War II the outer entrance wall was moved forward several feet closer to the pillars in order to add administrative space on the second floor. The modification, while well-designed and certainly not devastating, reduced the visual impact of the entrance. On August 16, 1963 the bank was absorbed in a merger with The Bank For Savings in the City of New York and its name was changed to The New York Bank for Savings. Shortly thereafter the building was abandoned, sitting empty for years during which time much of the copper trim of the roofline and dome was stripped off. Finally, in the late 1980s Central Carpet took over the landmarked building and retained the sometimes-controversial architect Robert Scarano, Jr to restore the structure. Because the interior as well as the exterior is landmarked, special restrictions had to be followed: nothing (such as display cases) could be attached to walls or floors and no permanent alterations made. After a short period of vacancy when Central Carpet moved out the building became home to Balducci’s, a high-end food store, from 2005 until 2009. In the summer of 2010 the New Jersey firm of Du-Rite Construction under the eye of Sal DeVito began another renovation to transform Robertson’s white marble temple into a CVS Pharmacy. Ahhh! That's my clock! I didn't know that Balducci's had moved on. That's unfortunate. It can't stay vacant for much longer. Can it? This is an absolutely gorgeous building. 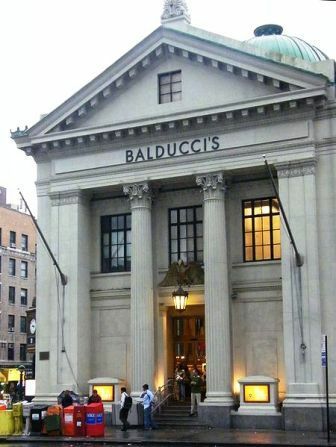 I worked there when Balduccis had the space, it is a real gem. Hopefully a business will come along that will do the architecture justice. The owner of this building must be a real genius! The building is not vacant! FYI - Potential tenants fought over the space! Just curious. Why does the National Register Register placque that appears to the left of the front entrance, reference Central Carpet and not the original bank. and PS. Thanks for sharing your research.